Seagrass stewards, your help is needed! Below you will find all of the information you need to participate as a Sarasota Environmental Aquatics (SEA) Team volunteer in the 2015 Sarasota County Seagrass Survey. The theme for this year's event is: Seagrass: The Lawn that Doesn't Need Fertilizer, focusing on how stormwater runoff and pollution affect seagrass species. Residual fertilizer that’s used on lawns can enter our bays and waterbodies as stormwater runoff. The increase in nutrients, such as Nitrogen and Phosphorus, can result in algae blooms. Algae can attach to seagrass blades and drift in clumps, blocking necessary sunlight from reaching seagrasses. The Sarasota County Seagrass Survey is a citizen science event that celebrates Sarasota County’s commitment to its water resources and focuses on increasing awareness of the economic and environmental value of seagrass habitat. 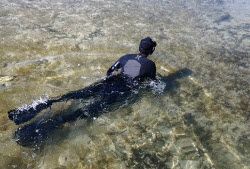 Volunteers and staff will take to the waters around Sarasota Bay to count and identify seagrass species, in an effort to collect data for the County’s Seagrass Monitoring Program. This fun, family-friendly, hands-on event will include on-site training for all participants and data collectors, followed by a free volunteer appreciation luncheon. We need the help of our local community members, including: snorkelers, waders, kayakers, boaters, and paddle boarders. Need more information? Feel free to contact the event coordinator: 941-650-1089 or amelton@scgov.net. Visit the Seagrass Page on the Sarasota Water Atlas to learn more about seagrasses and their importance to our coastal environment.